I'm taking a quick break from food blogging because today is my 16th wedding anniversary and I have been in the kitchen all morning/afternoon. I did take some pictures of a German Chocolate Cake and I'll post them this weekend. 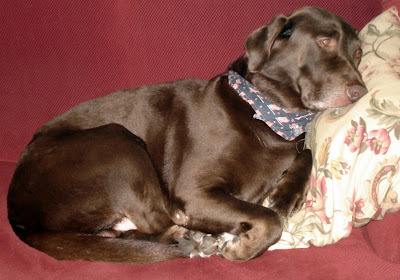 Until then...the many sleeping poses of our lazy chocolate lab dog, Bear. Awwww!!! What a sweet dog you have! !